The Church. The parachute and John Steele mannequin. 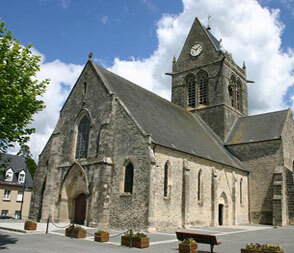 One of the most disastrous drops (in a night filled with disasters) occurred in Sainte-Mère-Église. Around midnight, a stray incendiary bomb had set fire to the house of Monsieur Harion, located to the east of the square. Wakened by the mayor and the tolling of the church bell, the townspeople turned out in large numbers to form a bucket brigade supervised by members of the German garrison. (The hand pump used that night still sits on the east side of the square.) While the house continued to burn, the drone of planes could be heard over the tolling bell. The fire-fighters, looking skyward, saw ghostly silhouettes drifting down on them. Two sticks from the 1st and 2d battalions had gotten their green jump light directly over the village. Illuminated by light from the burning house and tracers from German AA guns, the paratroopers were easy targets for the Germans below. Few survived. One who did was Private John Steele, whose parachute caught on the steeple of the church in front of you. The wounded paratrooper hung there limply for two hours, pretending to be dead, before the Germans took him prisoner. The less fortunate hung from the trees all around the square where they had been shot. Once the fire in Monsieur Harion's house had burned itself out and the last of the paratroopers were killed or captured, the German garrison (a transportation company) quite inexplicably called it an evening and turned in. A mile northeast of Sainte-Mère-Église, Lieutenant Colonel Edward Krause, commanding the 3d Battalion, assembled ninety men within an hour of landing and promptly ordered an advance on the village. Around dawn, the German garrison was again turned out, this time by the rattle of small-arms fire. Krause's men cleared the village in a rush, capturing thirty Germans and killing another eleven. 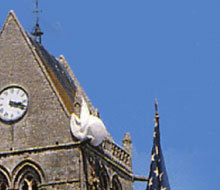 With Sainte-Mère-Église in American hands, Krause ran a worn American flag to the top of the village flagpole, a flag that he had carried with him from Sicily. 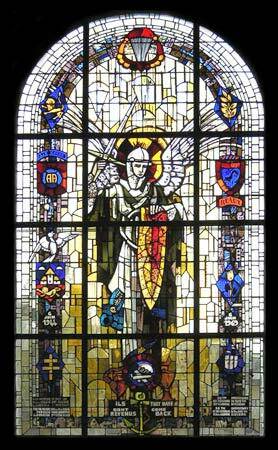 This stain glass has been offered by the 505th Regiment to celebrate the 25th Anniversary. 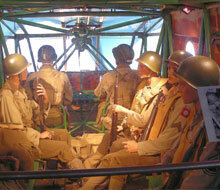 Inside of the glider displayed in the American Airborne Museum at Sainte-Mère-Église. I highly recommend the visit of this great Museum. 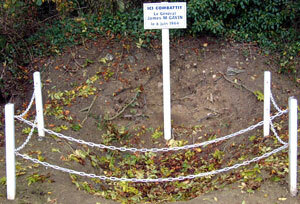 General Gavin's fox hole at La Fière. 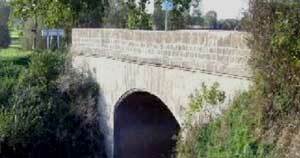 One of the most confused fights took place west of the village at La Fière Bridge, over the Merderet River. Uncoordinated groups from the 505th, 507th, and 508th regiments hold the position and finally went over the bridge on the 7th. The Monument Iron Mike is overlooking the site, its twin statutes is at Fort Benning. Alongside the road is General Gavin's fox hole. The photo of flooded marshland, a common occurrence that Germans exploited, shows the conditions as they were in 1944. General Omar N. Bradley called the assault landing on Utah Beach «a piece of cake», and it was, compared to that on Omaha. The landing plan called for the 4th Infantry Division (Major General Raymond O. Barton) to land along 2,200 yards of sandy beach on a two-regiment front, two battalions abreast. Colonel James A. Van Fleet's 8th Infantry (including the 3d Battalion, 22d Infantry) was to land at 0630, followed by the 22d Infantry in eighty-five minutes and the 12th Infantry at 1030. DD tanks were to lead the way in, preceded by an intense naval and air bombardment. Various engineer units were scheduled to land close behind the infantry to clear beach obstructions and to blow gaps in the low sea wall paralleling the beach. The landing of the thirty-two DD tanks was delayed when one of the control ships was sunk by a mine. Four of the tanks were lost when the LCT carrying them sank before they could be launched. In contrast to the heavy losses off Omaha, twenty-eight DD's made it to the beach able to provide fire support for the infantry already ashore. a stone commemorating the 90th U.S. Infantry Division. 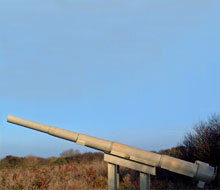 The first (designated 00) of the 1182 cylindrical milestones marking the «Voie de la Liberté», the route that the U.S. Third Army followed from Normandy to Bastogne. All bear forty-eight stars and a symbolic torch of liberty patterned after that held aloft by «Liberty» in New York harbor. They are similar to the stones which line La Voie Sacrée (the Sacred Way), the road from Bar-le-Duc to Verdun along which hundreds of thousands of French soldiers moved in 1916. 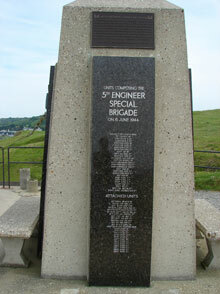 A monument to the 1st Engineer Special Brigade, raised in 1945 atop a blockhouse of the W5 strongpoint. 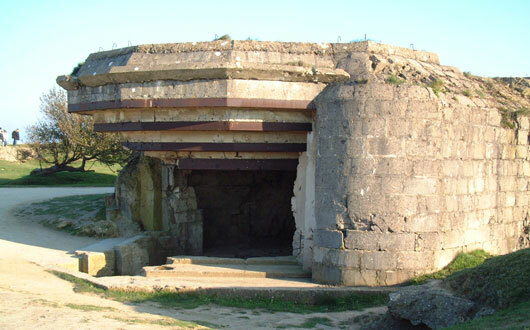 This massive blockhouse, captured on D-Day and used as the Brigade HQ, contains a memorial crypt (protected by a locked iron grill) commemorating the members of the Brigade who died on Utah Beach. Another plaque commemorates Maj. General Eugene Mead Caffey and the achievements of the Brigade he commanded. 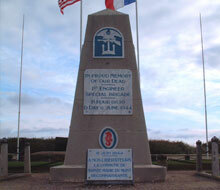 Other plaques in French and English commemorate the assault on Utah Beach. 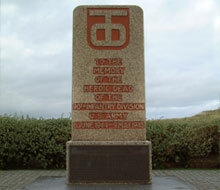 An imposing stone plinth, unveiled by General J. Laughton Collins on 5 June 1984, commemorating «in humble tribute... its sons who lost their lives in the liberation of these beaches, June 6, 1944». A stone plaque marking the presence of the heads of state of the United States, France, Great Britain, Luxembourg, Belgium, Norway, and the Netherlands for the 40th anniversary of D-Day. A stone plaque commemorating General Dwight D. Eisenhower as Supreme Allied Commander. Some fifty-nine road signs named after members of the 1st Engineer Special Brigade who died in the fighting on Utah Beach. I highly recommend this visit. Take an hour or so to discover an amazing number of bunkers, which were buried for years after the war and finally exhumed by the landowner. 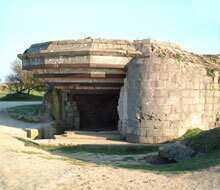 This fortified complex contained casemates housing 210-mm guns which easily reached Utah Beach. Despite shelling from large-caliber guns and repeated infantry assaults, the battery held out until 12 June, all the while harassing landing operations. 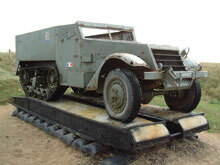 It was the one major battery in the lodgement area that actually became a factor in the post-D-Day battle. The casemates, that housed four French 105-mm guns, flank the road just before you enter the village. The casemates are not open to visitors. 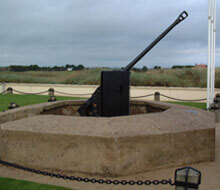 After withstanding attacks from the 22d Infantry for two days, the battery surrendered after a flamethrower, triggered by Private Ralph G. Riley, set off ammunition inside one of the casemates. Riley was awarded the Silver Star for his single-handed attack. By the end of June a camp for 20,000 German prisoners was established, which finally was extended to 40,000 men including 18 Generals and 6 Admirals. The Camp was commanded by Lt. Col. Kennedy. Unfortunately nothing subsists today apart a barn made with field stones use as explosive storage and use as private living home today. 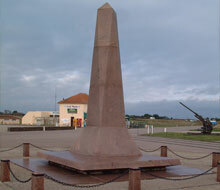 Les Dunes-de-Varreville (WN 10), the original D-Day landing objective of the 4th Division. In 1944, this area was strongly defended, and many of the original blockhouses still squat ominously amid the dunes. Today, the site is marked by a monument, a Sherman tank with French insignia which commemorate the 1 August landing of the 2d French Armored Division, a half-track and an armored car M18. 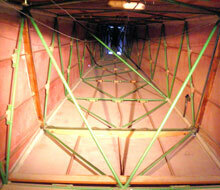 Its semi-circular wall contains the name of 1.557 MIAs, they come from 49 of the 50 States. 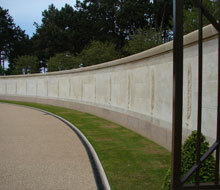 The tragic night of December 24th is engraved on that wall. German U-Boats were trying to prevent Allied reinforcements from reaching «The Battle of the Bulge». The 66th Infantry Division was not going to the Bulge, but Saint-Nazaire. At 6.00 pm on Christmas Eve, a torpedo exploded into the starboard aft hold of the transport ship «Leopoldville», packed with 2,235 G.I. 's from the Division. The ship remained afloat for 2-1/2 hours before sinking into the English Channel 5-1/2 miles north Cherbourg. Because of the holiday celebrations, rescue was slow in coming to the ship. When rescue ships arrived while the ship was taking on sea water, many different scenarios developed around victims and survivors. Approximately 516 G.I. 's were missing and presumably went down with the ship, and another 248 died from injuries, drowning, or hypothermia from the 48° sea water. 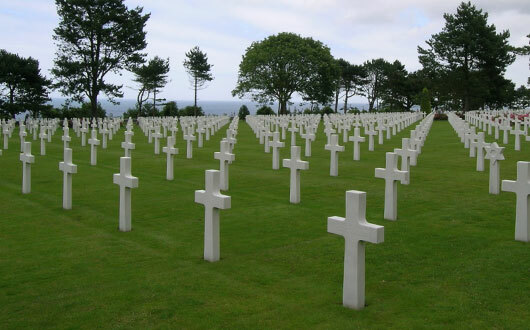 The huge loss of lives proved embarrassing to the governments of France, England, Belgium, and the U.S.A. Wartime security kept the tragedy details buried for fifty years. Many families of the 764 victims and the 1,471 survivors still do not know details about the Christmas death of their sons. 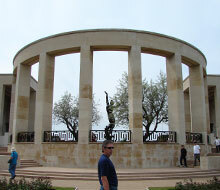 The Memorial is centered by a 22 foot bronze statue, on both sides two enamel maps, representing the Battle of Normandy in South loggia till August 1st and the Battle of Europe in North loggia, notice the shingles on the ground, reminding the beach. The four scenes on the urns in the north loggia are the same in the south one. The Statues and the urns were made by De Lue. Theodore J. Roosevelt, President Theodore son's and President Franklin D. Roosevelt nephew's. Born: 9/13/1887. Medal of Honor. Dead from heart attack at Méautis on July 12th during the night. Plot D, Row 28, grave 45. 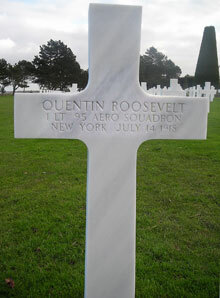 Quentin Roosevelt, President Theodore son's and President Franklin D. Roosevelt nephew's. Theodore's youngest brother. Born 11/19/1897.Dead in a Nieuport 28 fighter, was shot down behind German lines by Sgt. Thom, a German ace with 24 victories on Jul 14th 1918 WWI. Plot D, Row 28, grave 46. To reach the Pointe du Hoc Ranger Monument, now maintained by the American Battle Monuments Commission, follow the direction signs west along D 514 to the car park outside the monument (6 m). 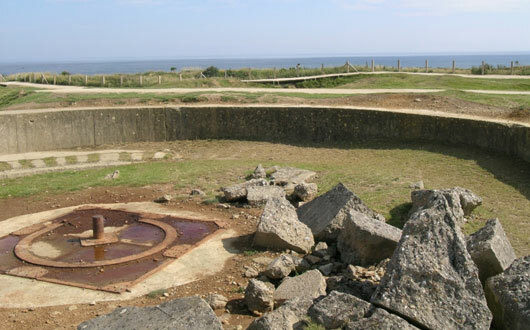 The Pointe du Hoc today retains much of its battlefield character because of the destruction left by the rain of bombs and shells the Allies unleashed to neutralize this rocky point. 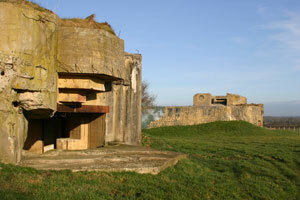 The much feared battery was bombed three times before D-Day, then hit from the air again that morning. 600 tones of bombs were dropped. The battleships Texas and Arkansas battered the area with their 14- and 12-inch guns just after dawn. The destroyer Satterlee saturated the position with her 5-inch guns in direct support of the Rangers. 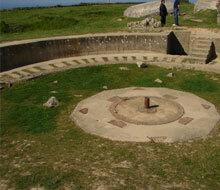 This concentration of fire left craters and ruined casemates which over sixty years have yet to erase. From the barbed-wire fence along the cliff top, you can look down the hundred-foot cliff to the east beach where three companies of the 2d Ranger Battalion, commanded by Lieutenant Colonel James E. Rudder, landed on D Day. Their mission was to scale the cliff, then silence the six 155-mm GPF thought to threaten the landing operations on both American beaches. 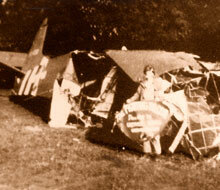 H-Hour was 6.30 am on June 6th 1944. The landing window had to consider the availabilities of landing craft, Navy and air support. Plus the combination of daylight, tide and moonlight. Low tide was at 05.30 am, sunrise was at 05.58 am. The D-Day planners decided to land at 06.30 for several reasons: LCA's could come closer to the bluff, minimizing the uncovered distance for the GIs, and all the obstacles would be exposed. 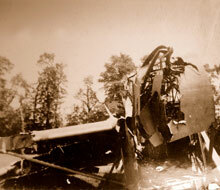 The sunrise hour permitted the Navy and the Air Force to optimize their shelling and Bombardment. In military times are discussed from the moment an operation begins thus: D-Day for the invasion of France in 1944 was June 6th. H-Hour is the beginning hour and minute of an operation. For the 29th, 1st and 4th Infantry Divisions H-Hour was 06.30 am, for the paratroopers 82nd and 101st H-Hour was 01.30 am on D-Day June 6th 1944. On April 27th 1944 was established the first Headquarter «SHARPENER» located at 0.8 mile from Southwick House, close by the huge SHAEF Camp «SHIPMATE». 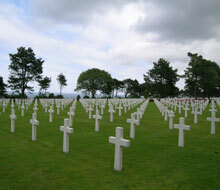 General Eisenhower stayed there from June 2nd to June 12th 1944. Regarding the inland movement on the continent, it had been decided to establish an advance HQ in the village of Maison in-between Port-en-Bessin and Bayeux on D6 road. Maison was selected because of its immediate proximity with Longues Air Strip (B11) and Tour en Bessin Airstrip (A13) and also a midway position between Omaha and Gold Sectors. This CP will be operational from July 31st and will be referenced as CP12. 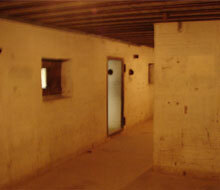 But it wasn't used by Eisenhower, only as a SHAEF transit camp in August 1944. It was decided to organize a new CP at Le Planitre near Molay Littry close by A9D, this camp will be use from August 5th but still not by Ike. Another one is activated on August 7th at Tournières, referenced as CP21 «SHELLBURST» where Ike welcomed Prime Minister Churchill, Gen. Montgommery, on August 20th Gen. De Gaulle with Gen. Koenig and many other celebrities. An airstrip was built in the next field. 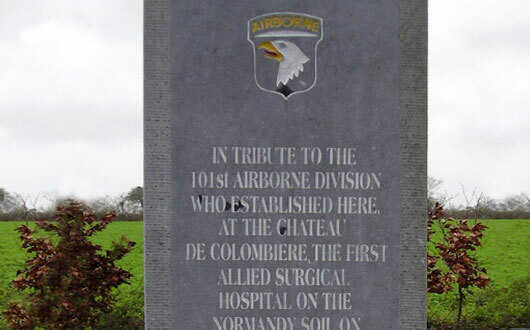 After the Saint-Lô breakthrough («Cobra» Operation) the SHAEF HQ was transferred near Grainville, on August 16th, Communication Service was established in the Hôtel Normandy, code-named «LIBERTY». On September 15th the new Grand HQ was moved to Saint-Ouen at Jullouville. Almost 3000 people worked there, and on August 30th Ike stayed at Château Montgommery at Saint Jean le Thomas 4 miles away from Jullouville. On September 10th the Grand HQ was transferred to Versailles (Palace Trianon). François Gauthron is an official tour guide. 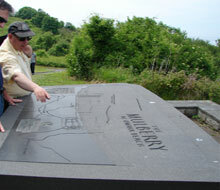 He has been guiding Battlefields for more than 15 years, Normandy is his region of birth.